This will be the first time I've posted a book review on this blog - probably the first book review I've ever done one since high school to be honest. While with games there are several components you can rate it on (e.g. gameplay, music, audio, plot, replay value, etc.) and even films to some degree (e.g. cinematography, casting, acting, plot, etc.) there really isn't much to go on with books besides how well the author writes and whether the reader takes anything of value away after reading it; whether the reader is being entertained or gaining insight. Another reason I've probably never done a book review until now is that there aren't actually that many books on the gaming industry as a whole considering how it's only really matured over the space of two or three decades. Most of the industry's pioneers have probably already taken to the Interwebs and posted their stories, making their experiences freely available to the world without the need to use this archaic medium. 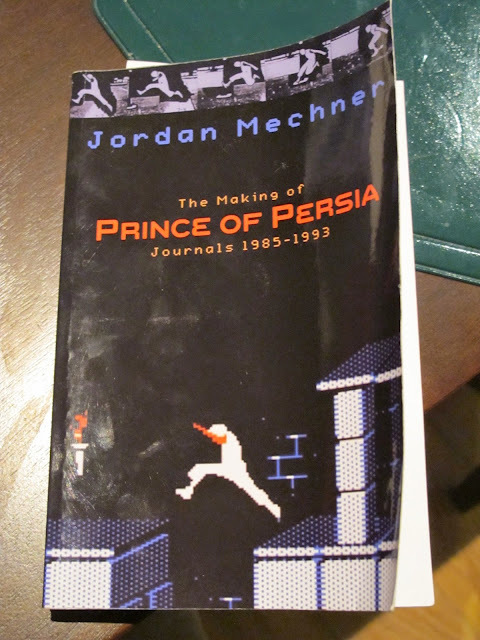 While I'm sure Jordan Mechner, famous for Prince of Persia, The Last Express and Karateka has his fair share of interviews and stories online none are so intimate and personal as this book he published called The Making of Prince of Persia: Journals 1985 - 1993 (which I'll call The Making of POP from now on). In fact, I have a new found respect for Mechner being brave enough to publish his personal diaries from 7 years of his life, warts and all. If there's people he didn't like, he mentioned about them in unflattering terms; if there were insecurities he had about his love life, his persona or even Prince of Persia's success, it's in the book. When I originally read the title of the book I was expecting a rather dry but informative account on how a veteran game developer went about designing and programming a hit computer game. What I ended up reading was something quite a bit different but thankfully a book that exceeded my expectations. Mechner's humourous anecdotes, occasional comments about historical events, brushes with other greats of gaming (e.g. Ken Williams, Richard Garriott, Eric Chahi, etc.) and even comments about mundane things like owning his first 486, helps transport the reader back in time, to the early days of the PC gaming industry and how it was like to be one of its major players. Sure there is the occasional journal entry that talks about the design process but this book is more about what goes through a legendary game developer's head: How does he feel about stuff day to day, how does he see the competition, what are his hopes, dreams and fears? You also learn a lot about Mechner's other passions, such as filmmaking and can start to see how his games turned out the way they did. Prince of Persia's rotoscoping technique for animation was lauded by critics of the day and The Last Express used this method extensively to give it that extra sense of realism. Mechner always wanted his first priority to be making films so we're lucky he actually ended up persevering with games as long as he did. The book also goes into quite a bit of detail about what was happening behind the scenes at Brøderbund and the amount of politics involved in providing resources for game development, something Mechner thought was lacking with respect to marketing of Prince of Persia. So would I recommend this book to others? Yes, I'd recommend it to almost anyone, although it'll obviously be of more interest to those who grew up playing PC games during the 80s and 90s (like myself). There are so many familiar experiences, names and events that you'll recognise during this pivotal era in the PC gaming industry and besides the nostalgia that goes with reading it, it's actually a pretty insightful book too. The only criticisms I have is that the book might be a bit light on the technical details for those of you expecting that kind of stuff and Mechner mocked one of my favourite game companies of the era, Sierra On-Line (just kidding :), I won't hold that against you). You can grab a physical copy of the book for $15.29 USD or a digital copy starting from $7.29 USD via Jordan Mechner's website. You can also read the first 41 pages for free.